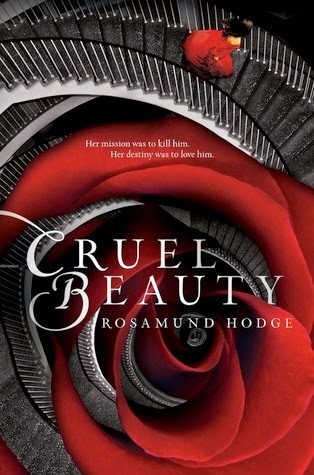 Cruel Beauty is another one of those books that I got to quite late in the game. It's not that I wasn't eager to read it right from the start, but for whatever reason, it perpetually stayed in the to-read pile until a month ago, when I finally took the plunge. It seems like most of my trusted bookish friends loved it, and I was very much expecting to bask in it's apparent awesomeness. Unfortunately, my feelings for it are more of a jumbled mess of good things and bad things. Much like this book. Caution: black sheep review straight ahead. If you love this book like air, this review might not be for you. The characters were...unique to say the least, and I enjoyed them for the most part. Despite the main character Nyx being quite difficult to love, I still found myself mostly sympathetic to her situation. That isn't to say that her constant changes in disposition weren't frustrating as hell sometimes, but I could see how her family issues, and you know, the fact that her father basically sold her into marrying a monster might affect her more personable side. It's true though that Nyx never seemed to be able to make up her mind on what exactly her purpose and motivations were. One minute she had the killer instincts of an assassin and in the next second, she turned into a hopeless romantic, desperately clinging to anyone who'd show her any kind of affection. o.O The entire thing was off-putting at times, but it didn't really affect the flow of the story. Ignifex was definitely a highlight for me, and easily my favorite character of the lot. His enigmatic persona, inherent sarcasm, bad boy persona and his situation made him a mystery I was bound to unravel. The only bummer was that I guessed the truth about him and Shade at the very start, so when it came down to the big reveal, I was pretty flabbergasted that Nyx hadn't guessed it sooner. I mean, wasn't it fairly obvious to everyone else who read this, or did I just get lucky with my hunch? To top things off, when it came time for the big change for both Ignifex and Shade, I just wasn't on board. I didn't want it to go down like that. I liked Ignifex just fine the way he was, thank you very much and I would have much prefered for him to be redeemed on his own than to meld with Shade. And then, for that to trigger a big: 'oooh the previous world was just a memory' trope? Ugh. o_O And speaking of Shade, while he was intriguing and mysterious in his own right, the insta-love declared by him and Nyx didn't especially sit well with me. After sharing one kiss, Nyx admits to the fact that she knows he already loves her and that she probably loves him too. Whaaa?! My other issues with Cruel Beauty lie mostly with the plot and it's resolution. Everything seemed unnecessarily complicated at best and a hot mess of detours and tangents at worst. The world-building was very good when it came to Ignifex's castle and it's many enchanted rooms but unfortunately, that didn't quite transfer to the mechanics of the actual world or it's magical system. To fully commit to the fantasy elements that were without a doubt the basis of this book, I needed to understand all the elements that made everything possible. Yes, I needed to understand ALL.THE.THINGS. Like, what exactly was The Sundering? Who were The Kindly Ones specifically and how did they come to be and rule? And for that matter, how did they come to 'not-be'? How do Ignifex's powers work, really? The basic construction of this world and it's inner workings simply weren't explained in enough detail for my liking. I have oodles of books that I have always been eager to read, but haven't gotten too. It is the dilemma that every bookish girl faces. It sounds like this book was all over. Here's hoping that your next read is a win. It totally is the dilemma us bookish people face on a day to day basis^^ So many people loved this book but yeah it was pretty much all over the place for me. Thanks Suzi Q! Sorry this was a dud read for you :(. It's like a roll of dice when you read hyped up books, you might love it or you might hate it, it's frustrating. I think why I liked Nyx as much as I did was because she was difficult to love. It just seemed like a nice change of pace compared to all the other books were the Main character almost has no faults. But, yeah, I agree, Her change in personalities throughout this book was really off-putting. I think I would have been more okay with it if it wasn't like a complete change in person; if she just had some doubts here and there instead of changing so much. Holy crap, we had almost the EXACT same thoughts about this book, it'd be scary if it weren't so awesome. I AGREE WITH LITERALLY EVERYTHING. 100% COSIGNED. I want to say that either Ally or Melissa has this out from the library right now, but my memory may just be faulty again, lol. If one of them does, I'll be curious to see what they think because I could see myself encountering the same issues with it that you had. I also need to know how *everything* works, and it drives me crazy when terms are thrown around but I'm grasping to pull their meanings together from a vague hint here and a vague hint there. I think I'll stick with ACOTAR for Beauty and the Beast retellings, hehe! YOU ARE NOT ALONE! I felt pretty much the exact same way about this book. I've been a lonely black sheep up until now. One of the problems I had was with the characters. I didn't like them. They were horrible, shallow people. I just didn't care if anything worked out for them. I gave it 3 stars, but mostly because of the mythology, setting and writing. It did go downhill about halfway through. I'm going to give her new book, Crimson Bound a chance, but if I have similar issues, I'm parting ways with the author. OMG! You are NO LONGER the lonely black sheep Michelle, now there's two of us^^ The characters aren't especially likeable you right, but I think I could have dealt with them a bit better if the world had been built up to my liking. Yeah the first half at least had me intrigued but beyond that I lost all the interest that had been building up. I'm going to give Crimson Bound a chance too - hopefully we'll have better luck with that one. I liked this book a little more than you, but not much more! I loved the audio version because the narrator had this rich, beautiful voice and I think that made me like the book more than I would have if I'd read it in print. I agree about the whole instalove thing and not being too happy with the whole Shade/Ignifex thing. I wasn't a huge fan of the romance, but I did like the idea of the Kindly Ones and the Sundering. It sounded like vaguely familiar creatures from Greek mythology so I wasn't too annoyed with the fact that they weren't well explained. I did really enjoy this one but can definitely, definitely agree with you about the issues. Because I loved the writing and fantasy elements and romance I was a bit more tolerant but this one is by no means perfect. Sorry you didn't like it more :c Are you going to try her newest book? Oh no, I'm so disappointed to see that this didn't go better for you. :( There are things that confused me too, such as the ending, but I just LOVED the writing, romance and heroine :D Great honest review though! It took me a year to finally pick this one up, and I have to agree with you. The writing and the imagery was just lovely. I enjoyed the personal conflict by the MC - doubting and searching for love. But you really hit the nail on the head when you said everything was more complicated than needed. Are you going to pick up her next novel? It seems that if the first one wasn't your cup of tea, the second one will probably be more to your taste. I hope your next read was much, much better! This is a great review! I read (listened to) this book last year when I just started blogging and I think I've grown to be more harsh with my ratings since :) I liked the castle, too, and I actually liked Nyx very much. Most of all, I liked what Hodge did with the B&B retelling - I really dislike "retellings" of fairytales that basically just tell the same story all over again! Cruel Beauty was refreshing in this regard. But yes, instalove, ah. And I remember the ending being pretty confusing, you're right about that. I was half hoping there would be a second part to this but as I understand it, Crimson Bound isn't a sequel at all. I still want to read it, though! Thank you Kaja^^ I completely know what you mean, I think my ratings have grown harsher compared to when I first started blogging too :) I agree that as far as retellings go, this was very unique and not at all a rehashing of the classic B&B tale...I just wish the world-building was satisfying enough for me. And yes, the dreaded insta-love almost triangle o_O that part wasn't my favorite either. Apparently, Crimson Bound is a standalone as well, I'll be giving it a chance too, hopefully I'll have better luck with that one! When I read it I was one if those that loved it. But I like reading reviews that didn't like the books I did because it totally makes be see things I missed it didn't bother me at the time. Yes Nyx was aggravating and I totally guessed the split Ignifex Shade thing as well. Like you I would have preferred they stayed separate. Fabulous review loved all of your thoughts. Myesh, I recall feeling the same way when I read this one. One part of me was just fine and dandy to just go along with the craziness of it all and enjoy it for what it was, and the other part needed explanations STAT! I guess it's just not the best kind of read for complex fantasy lovers, like ourselves.